New Google Site "Huge And Timely Opportunity For Hotels"
“With this functionality now present and prominently positioned inside the world's number-one search engine, you can expect a lot more of this guest activity to take place within Google itself rather than on OTA sites. This puts Google in an amazing position to make itself the central hub where all guest research and decision making will take place. 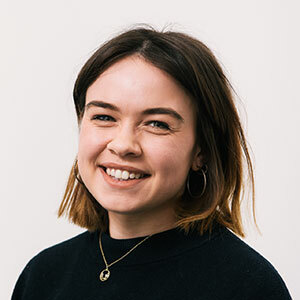 “And, as long as Google continues to allow hoteliers to own the guest relationship when participating in this experience - and we don't see that changing! - this is a huge and timely opportunity for hoteliers that they should seize with both hands." Entering search dates takes you into the Google Hotels experience proper. 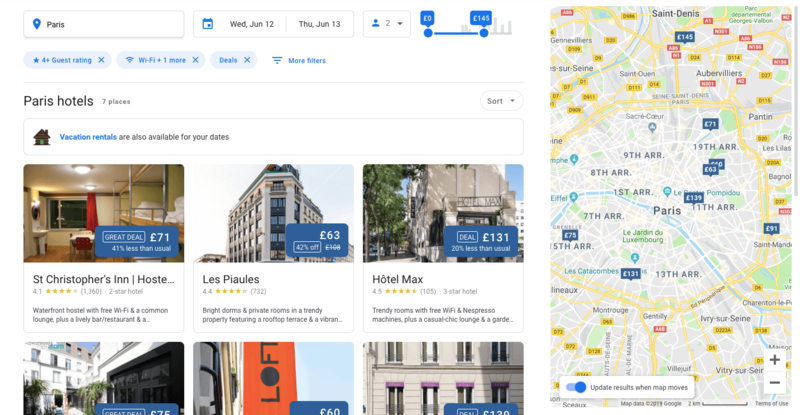 As an interface, it’s more than a little reminiscent of Airbnb’s search result listings. 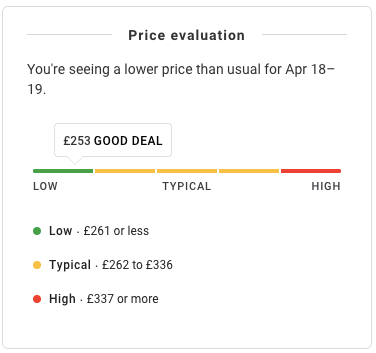 You can explore results via the map, by altering your preferred price, or by filtering on a variety of different criteria - including the new ‘Deals’ marker, which we’ll come onto in a second (or you can jump down there now). At this stage of the search, the meta auction isn’t visible - which makes sense from a user perspective. If you’re yet to choose an exact location, price range or even accommodation type (the opportunity to adjust our search to vacation rentals was clearly highlighted on desktop), you don’t need to know that there are five or six different prices available for every hotel. But that’s not to say that price and pricing options aren’t playing a role in the user experience, even at this early stage. When we first ran our search for ‘hotels in Paris’ then input our dates of June 12-13 (as we would if we were planning to attend Triptease's European Direct Booking Summit), the first two hotels we saw on our results were the Hôtel Ritz Paris (rate: £1,029) and the Four Seasons Hotel George V (rate: £1,079). We then searched Barcelona and clicked on a result at random: the Barcelona City Centre hotel (rate: £79). 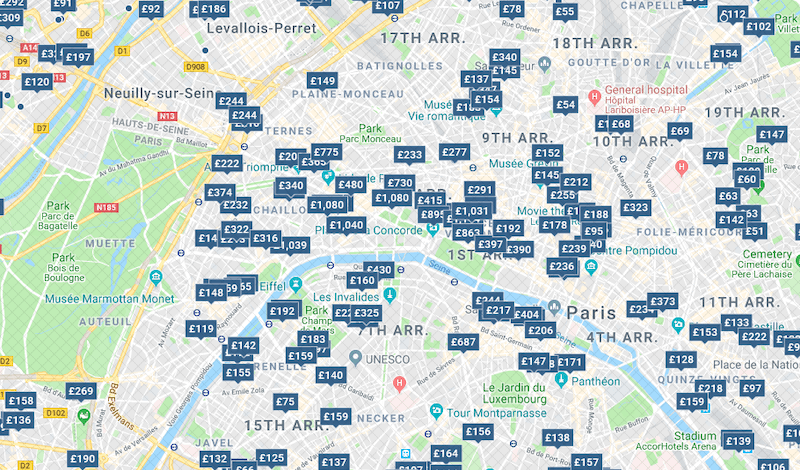 When we then went back and refreshed our Paris search, our results had completely changed: five of the top six hotels we had to choose from had rates under £100, and two were advertised as having ‘great deals’. We’d been firmly put in the low-budget, deal-hungry bucket of potential guests. As is to be expected, Google is altering how results appear to guests based on what it can learn from their search behavior. The search experience on Google Hotels is tangibly designed around getting the user to what they want in as frictionless a way as possible. We’ve already seen that they’ll adjust how results are displayed based on factors like previous search behavior, but that’s pretty much expected practice of ecommerce in 2019 (though it's something hotels struggle to achieve on an individual basis). What’s more notable is how phenomenally easy it is to narrow down your choice to two or three properties in just a few clicks. Starting with our generic search - just location and dates - we began by filtering our price point down to £145 and under. One click. Then, we upped our minimum guest rating (based on aggregated Google, TripAdvisor and OTA reviews) to 4+. Another click. Next, we selected a couple of amenities - free wifi and a bar. Lastly, we opted to filter on ‘Just deals’. In no time at all, we were down to seven properties to choose from. We tried to replicate the search on Booking.com and reached an almost identical number of results - six hotels. 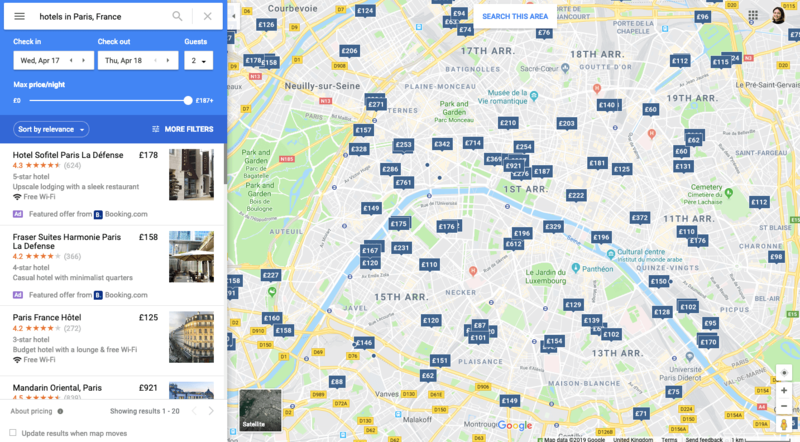 One property appeared in both sets of filtered results (Google’s and Booking.com’s). There are a bunch of implications here. Firstly and perhaps most obviously, your revenue management strategy (or lack thereof) will be made visible to any searcher checking out your hotel. Secondly and perhaps most importantly, it’s entirely feasible that an undercut price from an OTA will trigger that ‘deal’ tag, especially if it’s a significant disparity - which, while it might help your hotel stay in the consideration set for price-conscious searchers, will promote the fact that the best price for your property is available elsewhere. “We always need to remember that Google’s mission statement is ‘to organize the world’s information and make it universally accessible and useful,’” Scott advises. “This mission presents enormous opportunities to those able to take them. OTAs spend billions of dollars a year on metasearch. Hotels, on the other hand, get just one in 50 of their guests from meta! Hotels need a partner for guest acquisition that is able to leverage data scale like the OTAs do.